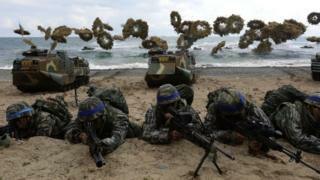 Joint military exercises between US and South Korean troops have long angered Pyongyang. US President Donald Trump says he has now agreed with North Korean leader Kim Jong-un to cancel them. Since the end of the Korean war, when Washington fought alongside Seoul against the North, the US has had troops stationed in South Korea. About 29,000 US soldiers are based in the South, under a security agreement reached after the war ended in 1953.Each year, the two countries conduct military drills, often called war games.Washington has described the drills as defensive in nature, but Pyongyang says they are a rehearsal for invasion and has long called for them to end. There are usually two sets of exercises every year, in spring and autumn, involving a massive number of troops and military hardware.Both involve land, sea and air military drills and computer simulations. In recent years, they have also involved practice drills for terror and chemical attacks.North Korea has condemned the drills as an unacceptable act of aggression, provocation and threat. Over the years, state media has described them as pouring "gasoline on fire" and risking an "uncontrollable phase of a nuclear war".This year, the spring exercise was postponed so as not to overlap with the Winter Olympics in South Korea. As part of the inter-Korean thaw, the Games were attended by North Korea and there was concern the military exercise could jeopardise the rapprochement. The drills went ahead in April instead. North Korea is also angered by the presence of US troops in other parts of Asia, most notably in Japan. There are also joint US-Japanese drills each year. Both in South Korea and Japan, there are mixed views on the military exercises. While many support the close military co-operation with the US as a key ally for the security it provides, critics say they are an unnecessary provocation and stand in the way of easing tensions with Pyongyang. The US also has a strong military base on the Pacific island of Guam, a US territory and a keystone of American military strategy in the region. Before the unexpected thaw between Pyongyang and the US, North Korea had repeatedly threatened to target US troops in the region. In August 2017, Pyongyang threatened missile strikes on Guam, the only US territory easily in reach of North Korean missiles. While Pyongyang says it has intercontinental ballistic missiles that can reach the US mainland, Guam is in reach of medium-to-long-range rockets. On 12 June President Trump announced the US would stop its war games with South Korea in a concession made to Kim Jong-un after the two held direct talks in Singapore. Echoing North Korean language, Mr Trump described the military exercises as "very provocative". "We will stop the war games which will save us a tremendous amount of money," the US president said at the press conference after the talks. South Korea's Presidential Blue House said it needed "to find out the precise meaning or intentions" of Mr Trump's statement.President Moon Jae-in spoke by phone with Mr Trump for 20 minutes late on Tuesday, but an official readout of the call made no mention of military exercises, according to Reuters. US military commanders in the South also said they had no warning of Mr Trump's announcement.While the end of the war games is granting Pyongyang one of its key demands, it is also in line with China's calls to stop the exercises to ease tensions on the Korean peninsula. Mr Trump's surprise decision has however been met with caution in Japan. The country's defence minister, Itsunori Onodera, said drills and the US military presence in South Korea were "vital to security in East Asia". There are no plans to suspend the annual exercises with Japan.